"The alchemists had two components to their philosophy. These were the principles of solve et coagula. Solve was basically the equivalent of analysis, it was taking things apart to see how they worked. Coagula was basically synthesis, it was trying to put disassembled pieces back together, so that they worked more efficiently. These are two very important principles which can be applied to almost anything in culture." Story and game. Narrative and system. It's a troubled, frequently renewed marriage full of misunderstandings. Roller coaster rides between disputes and reconciliation. We kind of keep the model going, but neither of the two sides really gets to shine. Therefore the following article will zoom out to look at the big picture, using Thomas Grips SSM framework as a starting point. It does a pretty good job on the analysis ("solve") of narrative and systemic aspects of modern-day games. However, the follow-up step of synthesis ("coagula") is kept a bit nebulous. Instead of new revelations or clarifications, we get a description of the status quo. In contrast, the second part of this article will try to sketch out two concrete results of ludonarrative synthesis, and thus possible synergistic bridges between two worlds that should conflict in theory. In consequence two equally valid, yet fundamentally different, approaches to game design will unfold. Rules: At its core, a system's behavior is defined by a specific ruleset. Interactions: Rules interact in certain ways and react to the input made by the player. This creates characteristic dynamics called "gameplay". Audiovisuals: At the lowest level narrative elements are simply audiovisual components. Plot: Via events and scenes over time an explicit storyline emerges. Now, as mentioned above, issues arise when trying to combine both sides on an equal footing. 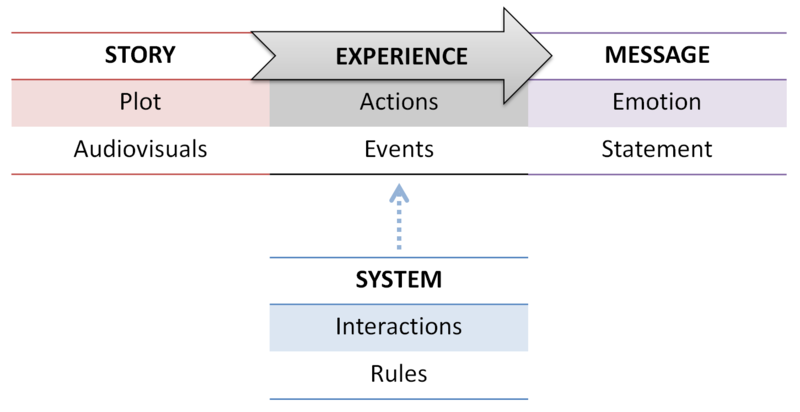 Systems are inherently strongly tied to the player. How challenging or interesting interacting with a specific set of rules actually is, depends to a large degree on the experience and background of the respective player. Ideally a game demands neither too much nor too little skill from its players, inducing a state of "flow". The excessive use of passive narrative elements can easily disrupt this. Stories on the other hand are way more linear and pre-planned in terms of their impact. Therefore full-fledged skill-based gameplay loops are of limited use for them. Typically they will rather represent an "annoying obstacle" preventing the audience from experiencing the next narrative sequence, thus disturbing the narrative's pacing. Many story games therefore operate without any loops (Heavy Rain, Gone Home) or keep them extremely simple (Uncharted) to not endanger their narrative flow. Systems are to be transformed into mental models. Knowledge: Players understand the set of rules itself. Understanding: Players apply their knowledge in the context of the system's output (feedback) to grasp complex gameplay dynamics. Statement: A specific statement emerges from the plot. Emotion: Statements are evaluated via emotional stimuli. An equal partnership will therefore necessarily have to result in and endless sequence of compromises and be highly limited in its potential value. Hence one of the two sides will have to clearly take the leading role. Indeed both possible design methods resulting from this approach show a lot of potential for synergistic effects. Putting the system in the lead will result in gameplay-driven games. Players interact with them repeatedly to iteratively refine their mental model, and learn to influence the system's dynamics reliably and deliberately (play). The focus lies on exploring the game's mechanical depth. Games in this category are not played for their story. However, intuitively intelligible story elements can support players in building up their understanding of the rules and their gameplay implications. In this case, thematic and narrative components serve the system. They range from very abstract (chess) to highly explicit (plot sequences). Even rather abstract games make use of narrative symbolism. Examples can be found even in games exhibiting a rather dry visual presentation. 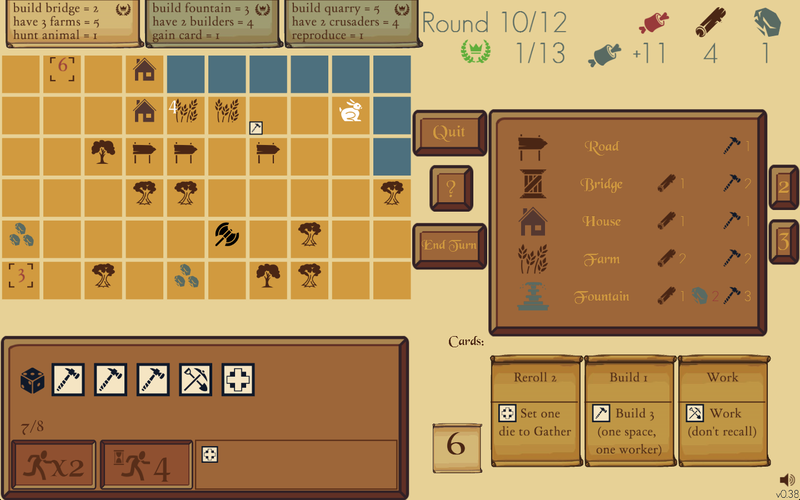 For instance, the dice in Axes and Acres (see above) depict different kinds of workers. The "hammer" stands for a craftsman who can construct buildings. "Pickaxe and shovel" work in the fields or the quarry. The games symbolism makes use of its players' common knowledge. On the other hand, the follow-up title by the same developer, SkyBoats, exemplifies a not quite as intuitive thematic coat of paint. Players consume asparagus, carrots, bananas, and indeed rubies, to fuel airships or even create specific patterns of wind currents on the board. The game's creators may be the only people on the planet who understand this narrative logic. Now, of course there are also less abstract examples, even in the realm of "gameplay games". For example, Portal's famous "companion cube" represents one step towards explicit narrative. Card mechanics in Gwent are regularly based on stories from the Witcher universe (Ronvid of Small Marsh). Characters in Overwatch or Atlas Reactor come with extensive background stories. In short: The appropriate narrative "dressing" can make it significantly easier to grasp and memorize abstract mechanisms and their relations to each other. In contrast to the above examples, story-driven games aim to convey an experience, be it via special life circumstances (Papers, Please) or taking on certain societal roles (Cart Life). Players go through events, take actions and are transferred into emotional states. In this case mechanics are primarily used to support these perceptions. System serves story. 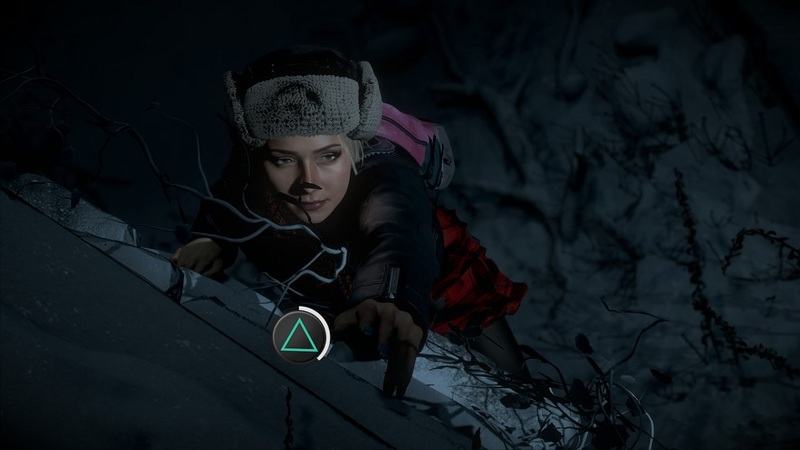 For this purpose, gameplay quite regularly takes the form of linear arcs instead of self-contained loops. Games of this category are generally not played for the gameplay itself and would not be all that interesting without a strong narrative. Since this design approach is very young, there are still a lot of questionable experiments. An infamous example: quick time events - pressing predefined buttons at the right time. In spire of how mechanically simple they are, they regularly dislodge the story from the driver's seat. They do not place players in a narrative situation. Quite the opposite is the case. Players' reflexes dictate the physical abilities of story protagonists. Players do not become one with the thinking and feeling of the acting character, but remain on the level of the mechanical controller acrobat. And if they fail, the scene is simply repeated. Obviously the story was not meant to be over yet. That's anything but well-paced or immersive storytelling. Other games, such as Telltale's The Walking Dead, position their mechanics right inside of the actual storyline. They let players decide how the story should play out. In extreme cases, those choices can influence the story's message at its core. The question is whether this should be left for the audience to decide in the first place. Usually those choices are to be made by the author as the expert on storytelling, impact, pacing and so on. On the other hand, if player decisions did not have significant impact on the story, they would be irrelevant to begin with. Incidentally, the latter is quite common in those games. To prevent excessive branching which would render coherent storytelling basically impossible, most options quickly turn out to be "fake choices", manifesting the suboptimal use of those titles' interactivity. Of course there are also cases of the mechanics not fitting the story at all. Generally this goes along with the well-known problem of ludonarrative dissonance. System and narrative are fighting for leadership. In the end both suffer dramatically. However not all is lost! Throughout recent years some outstanding titles demonstrated how to make use of interactivity for the purpose of storytelling in a much better way. For example, Brothers: A Tale of Two Sons establishes its dual-stick gameplay over the course of the whole game, just to then break away from it and be able to bring it back during its finale in an emotionally incredibly effective manner (spoilers!). This represents a much more consequential and tighter integration of interactive components into the narrative message than the above examples. A glimpse into the potential power of mechanically supported narrative. 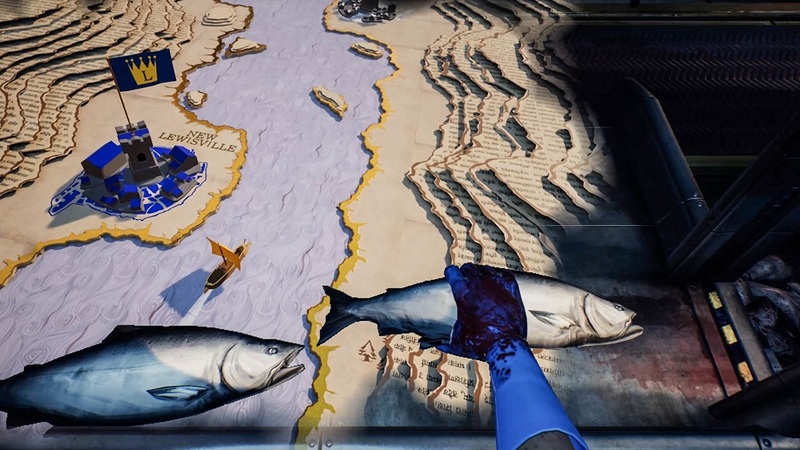 The same goes for What Remains of Edith Finch, the most prominent example probably being the "fish cannery" scene. On the one hand it mirrors the nature of mindless busywork in its repetitive gameplay tasks. On the other, it makes use of explorative mechanics and slowly lets them take over over time, depicting the protagonists's escape from reality. The dualistic nature of the controlled character's world of thought is made tangible via specific gameplay dynamics. Other examples include the investigative, barely interactive Her Story, the skyscraper of meta levels The Stanley Parable, or the mechanically and thematically equally bleak This War of Mine. Those titles hint at the unfathomable potential lying in the design approach of interactive narrative. After all a symbiotic coupling of story and gameplay is possible, as long as one of them decisively takes control and lets the other take on a supporting role. 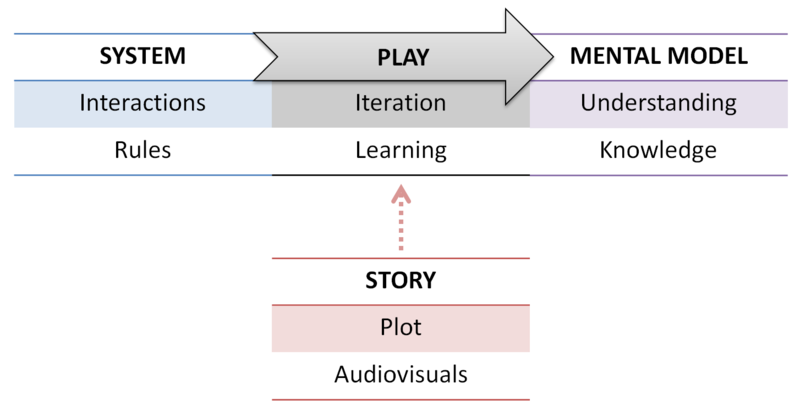 Interactive systems should employ narrative elements cautiously and deliberately to optimize the mechanical learning process their players will have to go through. Interactive stories in turn would be wise to make use of gameplay mechanisms, first and foremost, to support their narrative messages. When both sides concurrently try to take the lead, they will inevitably step on each others' toes. To refine both forms, there will have to be a clearer distinction between their design methodologies in the future. They both address completely different skills, perspectives and preferences during the creative process, among critics, and within their audience. Basically we are looking at two different kinds of media, who simply both happen to make use of interactivity in one way or another. This differentiation in public perception is bound to happen sooner or later. Both art forms are still on the search for their own identity and have just started to define and formulate their individual demands and characteristics. So far we have only seen the tips of two presumably giant icebergs. Many thanks to Sebastian S. (Xing) for feedback and "intellectual sparring"!